I had a recent lunch with a friend where we started talking about "Gamification”. During our conversation, we were both reluctant to use the word to describe anything we’re working on because it’s just not cool anymore. First off, I've never liked how it’s spelled. It almost reads like “Gammification” which sounds like you’re trying to make a giant Kaiju from a tiny turtle. When most people hear "Gamification", they think of adding achievement systems to otherwise boring tasks, like exercising, getting coffee, or doing your taxes. And so “Gamification” has been overused and polluted to the point where people think it’s a marketing ploy to sugar coat cat poop. But I felt like even though the term is bankrupt, there is something powerful about taking what makes games fun and applying them to tasks, so I propose a different way to think about "Game-ification”. What if instead of sugar coating, you think of “Game-ification” as Simplification. I argue that all universally enjoyed games are good because they make it easy to understand how actions lead to success within the first few minutes of play. To do this, good games need to limit the number of actions a user can take and of those actions, make it intuitive that performing the right set of actions leads to success. Angry Birds is so widely enjoyed because it's easy to understand the limited rules of play within seconds of picking it up. The 2D game world limits the dimensions the user has to consider, it builds on our natural understanding of physics, and how actions leads to success is intuitive. If you limit and simplify what you need to learn to succeed, and then make it *really* easy for the user to understand when they are succeeding, any one can feel like they are mastering the game quickly. That feeling of learning something new and then understanding it enough to be successful at it is a natural source of enjoyment. 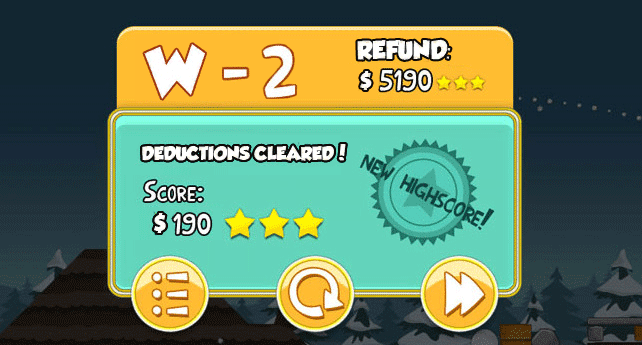 Now great games (and I'm willing to say Angry Bird is a great game purely from the kind of revenue it pulls down) start you on the learning curve quickly, but as you play more, you are rewarded with the allowance of new actions or you are taught how the same actions can be used to solve new obstacles. The feeling that you keep mastering each new level of play and each new level of play is worth mastering is what keeps you coming back. It is an art in game design to make sure you don’t over complicate the game with the addition of new actions or introduce obstacles that are so hard that they create learning cliffs. Portal and Kerbels Space Program come to mind as games that walk this line well (although Kerbels Space Program is not a game I would recommend to anyone but a veteran gamer). Let’s consider the “Game-ification” of doing your taxes (something we’ll all be doing in a couple of months). For the common non-lawyer resident who doesn't get paid to understand tax code, doing your tax return can be soul suckingly over complicated. Now I've been a fan of TurboTax for many years now and consider it a successful "Game-ification" of doing your tax returns (I am in no way a tax app expert so don't take this as a blatant advertisement right before tax season). TurboTax is a win for me because they limit the amount of actions you can take as they lead you through the “levels of play.” And I'm rewarded with clear indicators of progression through well described and easy to understand milestones. The refund "score" that's always at the top of the app is a fun reminder of how your actions are effecting the end goal. I don’t care if TurboTax gives me a virtual pat on the back or a "Goodwill Deduction” badge. By limiting the actions I can do and making it brain-dead clear how those actions lead to my refund, I feel like I've mastered how to do my taxes. So let's say “Game-ification” is the art of simplifying and making more intuitive the rules of cause and effect of an otherwise complicated and open ended system. A successful "Game-ification" makes it easier for people to feel like they are climbing towards mastery. Also, let's put a tombstone over "Gamificaton" and start using "Game-ification". Or perhaps to make it easier to differentiate, let's call it "Simplifying the Curve."